It goes without saying that the market for Vintage 1960’s Concert Posters has exploded in many positive directions over the past 3 years. We have been so busy here at PAE, that we have let our blog go dormant, and we wish to extend our apologies for this. We know this has frustrated many collectors that had come to rely on us for the most up to date information in this exciting marketplace. Please know that we are now answering your many requests for up-to date- information and we are committed to publishing new blog posts every Monday morning. Please be patient as we disseminate a huge quantity of news over the next several weeks. The next few posts will be a mixture of reviewing what has transpired over the past 36 months and while also explaining what is happening now. So, if you see a post pertaining to a past event (there have been many critical ones!! ), you’ll understand its purpose. One requests we have of you. We hope that this blog re-launch will serve as a 2-way forum and conversation. If you read this blog, PLEASE chime in, as it takes a lot of work to generate this content and it’s nice to hear from you on the other end. Hot News! The Bill Graham Museum Exhibit! One of the recurring reasons why collectors are so “bullish” on this market is the acceptance of these historically important posters as legitimate artwork by mainstream museums. Over the past several years, there have been major retrospectives and highly successful exhibitions in many of our nation’s most prestigious museums including the New York Museum of Modern Art, The San Francisco Museum of Modern Art, the Whitney Museum of American Art, The Laguna Art Museum, The San Diego Museum of Art, and the Smithsonian Institution. It was not uncommon for these exhibits to feature long lines and rave reviews. 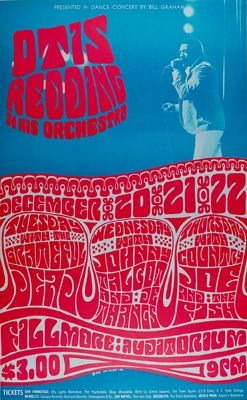 However, no past exhibit of Vintage Concert Posters can compare to the current Bill Graham exhibit at the Skirball Cultural Center in Los Angeles, California that currently runs through October 11, 2015. No amount of superlatives does this exhibit justice: Exciting, engaging, detailed, highly professional, historically important,etc. The exhibit is all of these and more! Most importantly, it weaves together the story of music, a man and a movement that is captivating to ANYONE, regardless of their taste or interests. It’s THAT GREAT! Clearly, if you are reading this blog, you MUST do whatever it takes, to see this exhibit. It will blow you away and exceed your wildest expectations! Aside from the enjoyment you will get from attendance, there are far greater ramifications at work here. This MAJOR MUSEUM EXHIBIT (which will travel after October 11th) will undoubtedly fan the flames of awareness and appreciation for these ultra rare, historically important artworks. This will undoubtedly lead to more collectors, a further dwindling of supply and rising prices. This is not some wild conjecture or prediction, it’s happening every day as you read this. The lines at the museum are indeed impressive. As a reader of this blog, you are way ahead of the pack. Use your superior information and knowledge to your advantage. Fill in the missing pieces to your collection NOW, while they are still available and utterly affordable!